Why did organisers allow a Right to Life stall at the Multicultural Festival? The National Multicultural Festival was held last weekend. File photo. The ACT Right to Life stall at the Multicultural Festival that showed a model of foetuses in the womb at different stages of development and photos of an unborn baby’s feet is causing a stir in the local community, provoking a petition for the ACT government to ban the organisation from the event. The petition, which was started by Jess Chalker, said the ACT Government should ban this organisation and all anti-abortion organisations from the festival. “Every year the national multicultural festival is held in Canberra. It’s an amazing weekend of celebration. Unfortunately for the past few years, the ACT Right to Life Association has been able to have a stall,” the petition reads. The petition so far has received more than 650 signatures. A stall showing the benefits of keeping a child seems an odd fit for a festival celebrating the many cultures prevalent within the nation’s capital. According to the 2019 terms and conditions for festival stallholders, display materials must be sensitive to the diversity of community members attending the event. The T&Cs also states that organisers have the right to remove any content they deem offensive. ACT Right to Life Association president Bev Cains said the organisation had a stall at the festival for nearly 40 years and had paid the festival $150 to have the stall on Sunday. “We have a stall there for educational purposes,” Mrs Cains said. “We have been a part of the Multicultural Festival since the 1980s. Before the Multicultural Festival existed, we were part of the Canberra Day Festival and we have been showing the same models of the development of a child in the womb. Mrs Cains said the organisation would have the same stall next year and if organisers removed them from the festival, they would take them to the Administrative Appeals Tribunal. When Region Media approached the Festival organisers for an explanation and queried if organisers had deemed the stall content inoffensive, an ACT Government spokesperson said no stalls at the Multicultural Festival receive any endorsement from the government. “These stalls ensure members of the community have the capacity to provide information on their community organisation,” the spokesperson said. 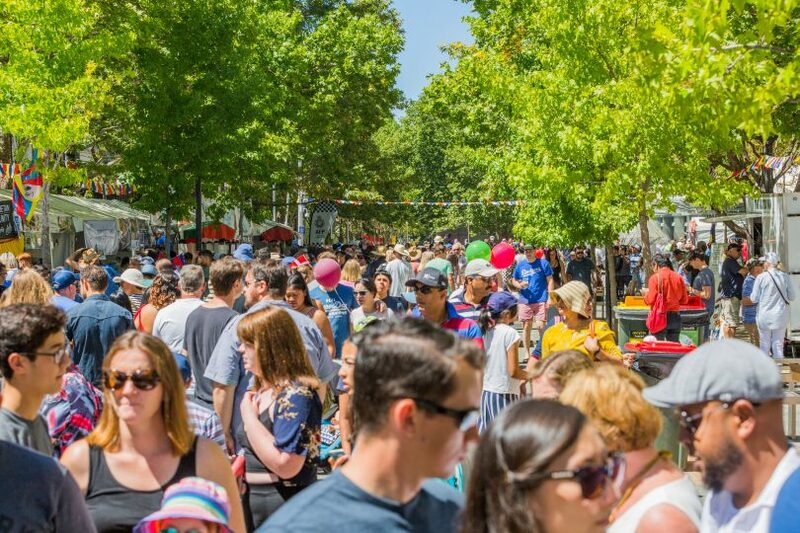 “It is important to note that there is no endorsement by the ACT Government of particular stalls or particular information presented during the Festival. What are your thoughts on this issue? Share them with us by commenting below. Because every culture has a right to life! Culture and life are intrinsically linked. God bless the people that allowed the stall. And every woman should have the right to choose. A multicultural event made for bringing everyone together is simply not the place for such a divisive stall. Choose what - death? If a pro-life stall is divisive to you, you belong to the wrong culture. Luke Portelli Open your eyes and read how divisive the commentary here on it is, alone. Yes, disagreement causes division. Choose life - please. Melissa Flis so you're saying you want to ban everything that you don't agree with? What! That would have pissed me off.... glad I didn’t go. If half the stalls were political and religious nobody would go. In that case get rid of them entirely. If you can’t fill all the places lower the entry fee. Also wouldn’t be call a multicultural festival. It would be called information and ideas festival or something similar. Why can't they? Are you against free speech? Culture = food, dance, art and children's stories, only? But not heartfelt adult beliefs about how living should be done, if they're not mainstream. Diversity is great, as long as it doesn't make us feel uncomfortable or confronted? Wow, what tolerant people we are. There's a big difference between being tolerant, and allowing the MCF to be used to further a political agenda (of any kind). Jessicah Mullins I think the MCF needs to be very clear about where it's limits are on what is a cultural thing to include. Is the Red Cross cultural? Should it be allowed to fundraise or spread it's message there? On what basis? What about a Buddhist temple? A mosque? A smoking ceremony and explanation of the sacredness of landcare? Wholefoods as a way to treat your body as a temple? And if they're OK, then also the Catholic church and the Methodists? And the sacredness of unborn fetuses? Pacific Island legends about the sacred aspects of ocean? The festival organisers need to define where they are going to draw their lines around such things, if they draw any lines at all. They want to remove a woman's right to autonomy. How does that not upset you? Russell Nankervis how and why does me feeling upset, necessarily translate into me wanting to trash the principle of free speech? I get upset by drunks yelling, too. Should I try and ban drunks from yelling in public because I feel unsettled when they do it? The festival had stalls representing A Gender, Red Cross, ACT Labor and Liberal, Girls Grammar, Dept of Human Services, Hepatitis ACT, Relationships Australia, etc. None of these are 'multicultural'. If the criteria allows these stalls, then it allows the Right to Life stall, however distasteful that may be. To exclude them based on the views of individuals would be against the principles of free speech (unless it moved into hate speech, which is another kettle of fish). You all know the saying by Voltaire: I may not agree with what you say, but I will defend to the death your right to say it. Yep and they can get rid of the Chips on a stick whilst they're at it. Stephen Esdaile I agree with you, I don’t like their message, but if we allow other non-culture based stalls (like political parties and the like) then we must allow them. Plus, it gives people (like me) a bit of entertainment to argue with them. Yeah....who'd want to listen to someone who made a point of going up to a stall just to pick a fight like what James Shaw seems wanting to do? Embassies, cultural groups, and food/drink stalls. That's all. Andrew Duncan possibly the same people who think it is OK to picket women using reproductive health services. Talk about picking fights seems irrelevant when the people being picked on are the same people who use god to harrass women at some of their most stressful moments. Yep I just walked past shaking my head of the stupidity of some ppl. Stephen Esdaile well said Stephen E. Nothing like introducing facts into a discussion. You buy a stall, to get some public exposure, if you don’t like what the public gives you in return, that’s their fault for having stupid morals. Why are they the only ones allowed to try and convince people to follow their moral compass, surely being subjected to their silly ideals means I have a right of reply? Who knows maybe I could convert a few? They are about inclusion and respect. Anti abortionists are about the opposite. This is a false dichotomy. And that’s why we need to reinstate the Community Festival day we had years ago during what was known as the Canberra Festival. None of these stalls should have been there, their contribution to multiculturalism is very tenuous. And while we are talking about what doesn’t belong, I get maybe one Chips On A Stick to represesent whatever culture it represents, we don’t need 5 of them. I don’t care what kind of sponsorship they provided. Again, more suitable to a Community Festival. It's all to do with respectful debate and tolerance. Stephen Esdaile most people I know who feel strongly about the issue have genuine concern about the competing rights of a woman to choose and an unborn child to life. Anyone who thinks it's black and white and only one side of the issue should be allowed to speak forgets what a free society is about. There ARE some cultures that totally believe abortion is murder. Are we, the Canberra mainstream, going to pick and choose what aspects of the cultures we allow to be showcased at our event? Or are we going to allow the multiple cultures to represent all the aspects of themselves that they want to? Will we limit them to showcase only what we will not feel confronted by? I'm pro-choice, but also pro free speech. I have no problem with being reminded, and recognising, that there are people in my world with very different ideas of right and wrong from mine. That there are other aspects to different cultures than food, drink and dance. That I don't have to feel happy about all those aspects, to respect other cultures. Would be be ok with a group that supports and promotes genital mutilation because it is accepted in some cultures? I'm sure they feel the same. Hans Dimpel no, I do feel that promoting illegal practices would NOT be acceptable. Also, suppression of female autonomy is widespread in many traditional cultures but stalls promoting honour killings, or wife-beating, are not on. One has to draw the line somewhere. If safe zone law had not exist yet, would it be ok to have stalls that promote protesting in front of clinics? It was legal wasn't it (and still legal in some places)? Didn't you just pick and choose yourself? You just picked aspects of cultures that are not illegal. I do not see any right to free speech being trampled even if the organiser have some guidelines for stalls they allow. They organiser have the rights to give platform to whoever they want. It's not like the organisation suddenly lost their voice. If we do not agree with them, we are free to protest or boycott the event. It is also our rights. Erica Burford it's a multicultural festival... not an election campaign. Different cultures have different political and moral compasses but that's not what we should be focusing on. Hafiz Khusyairi quite right, my line is drawn at illegality. I feel like it's wrong for a government funded festival to promote illegal practices. Angela Hunter "that's not what we should be focussing on" is your personal opinion. It may be a mainstream opinion, but clearly not all cultures agree, and it's not explicitly in the published raisin d'etre for the festival. Having the culture present is fine... Having a stall for a single issue within a culture for political propaganda is not. Ally Wordsworth like the Red Cross pushing the need for health-promoting charity work. Ban the controversial ones or ban them all. Just be open, honest and consistent about what you ban and what you allow. This is not being manned by people from another culture. Our country offers free safe access to abortion. It’s not up for debate. This is about creating fear. It’s completely ridiculous to infer it’s a cultural information centre. The control of women’s bodies is patriarchal DOGMA. That’s not culture. And if it is, it needs to be replaced and I’m pretty disappointed that a “pro choice” advocate would make such an inaccurate and misleading argument. Petzi Snarbrook who said I was a pro choice advocate? I said I am pro-choice myself. Yes it's disappointing to have "our" conglomerate culture represented by fearmongerers. As well as by the Red Cross. But should we shut them up? Or should we rather go represent our alternative beliefs, as central to our culture, next year? And if you honestly believe patriarchal paradigms are not central to myriad cultures, you're dreaming. I like to believe that Canberrans believe female autonomy is more important. I hate them, but they have a right to have a stall. We can't exclude them. They're big on rights too. Hate? Can't you just disagree? No, they actually think they should get to decide what to do with my body, and have a history of vilifying and abusing other women. hate is appropriate. Why would you want a group who actively oppresses you to be there. You wouldn't want Nazis there. Because free speech is important. It's more important that free speech is preserved then me getting my way. If laws were introduced that infringed my rights, I'll carry a pitchfork and flaming brand with the best of them. Jess should go back to high school so she can learn that in a democracy you can’t simply ban stuff that you disagree with. On the other hand surely the organisers of the festival have a range or parameter of the type of stalls that they want at such a festival. Presumably you wouldn’t want stalls promoting hunting or adult entertainment or extremist groups at a Multicultural festival. Why should they NOT have a stall there. And … if it is decided that they should be banned, then I hope equally anyone else promoting political viewpoints should also be banned. MD Carol and they should. MD Carol because it doesn't fit the event, and nor do political stalls. MD Carol point well made. Interestingly the commentary here, is it has nothing to do with the multiculturalism. I would argue differently many of the countries represented at the festival still ban abortion - Ireland for example has only just legalised abortion in the first 12 weeks of pregnancy. It has everything to do with cultural, religion and a diversity of law. Whilst I find it an entirely difficult subject to grapple, women have a right to choose however it doesn't it any way prevent me from considering the views of those that argue differently. The point of the multicultural festival is to celebrate different cultures around the world through art, dance and food.... Not political views and definitely not to protest over opinions on what is right and wrong. I also don't agree with sports organisations having stalls representing other nationalities when they are not even part of that community. Pen Gwyn really well put Pen. Yes but you take our the strictly Non Multicultural aspect and think how many stalls go? Ban then. It’s inappropriate and ridiculous to allow public lecturing of woman and how they manage their health. Oscar Mike not a human until it’s born. If not human then why are people so excited when they find out they are pregnant? Devastated at a miscarriage? Andrew because of the potential. also, I get excited about a pair of shoes and I’m devastated when they don’t have my size. Should there be a Right toLife booth for shoes? Shoes are people too? Would those criticising this group support a pro-abortion group being present? No. It's not a relevant stall for the MCF. Andrew Duncan did anyone imply that? JeeKay Dee so the Australian Republican Movement ? What about the North Canberra Bears? Peter Bee Not relevant either, tbh. They don't really have a place at the MCF. I think reason why this case is garnering such attention is that abortion is very divisive issue, and a stall advocating pro-life is very closely linked to shaming women and bodily autonomy. Andrew Duncan no. Nothing to do with 'culture' either way. I'm pretty no one in Canberra is "pro abortion". I think most people in Canberra want women to have access to safe legal medical procedures so they don't have to resort to backyard abortions or risk a criminal conviction for undergoing an illegal procedure. or be forced to travel interstate or overseas. Agreed Hans Dimpel. It's more pro-choice and pro-bodily autonomy. Don't think that a "pro abortion" group actually exists, do they? Agree Jessicah any group that supports abortion being safely available is about pro-choice and pro-bodily autonomy. .....actually I don't know anyone who has had an abortion who was "pro-abortion" per se. They are pro-choice and it was a choice they felt they had to make because of their situation at the time and the well-being of themselves and the potential life at stake. Come to think of it, I actually don't know anyone who has had an abortion who was in a safe, stable, consensual relationship. The main reason they had an abortion was because there was not a father who was willing to share the responsibility, and the young woman couldn't do it by-themselves at the time. Andrew Duncan no! Neither side of that debate belongs in a cultural festival. They’ll say no but they really think yes. It’s a multicultural festival. A celebration of different cultures from all around the world. It is not a festival for “information” about what a woman should or should not do with her body. You want a stall, go to a different kind of exhibition to do with health issues. The anti abortion movement has no place at a celebration of cultures, regardless of whether they pay their $150 or not. Ally I haven’t seen it yet, but I agree. Plenty of people that aren’t religious don’t believe in abortion for their own reasons also. I think most people who have issues about abortion don't care what a woman does with her body, they care about tiny human lives being extinguished. It's not about outlawing free speech. It's more about whether or not that group is relevant for the event. Paul Chubb slowing this kind of stall at the multicultural festival is not in keeping with the meaning of the festival. It's not at all about reducing people's right to free speech. So let's not conflate the two. Hey Paul, you have no ‘right’ to free speech here matey. You’re thinking of the US. Arguing to shut down access to safe medical procedures has no place at a Festival of any sort. So you are saying everything else there was cultural? I saw lots of stuff that wasnt. A new zealander singing generic pop and chips on a stick to name two. If the definition of cultural is to be so narrow then it goes across everything. A statement of belief on what should be acceptable in our culture is always within the definition of Multi cultural. Equally the reason for the festival is to celebrate and accept diversity. Exclusion goes in the face of that. Jessicah Mullins there were many groups there that had no relevance to multiculturalism. I suspect there is no outrage over the others, which suggests it *is* about free speech. Paul Chubb I agree. If a belief about life is part of one's culture, should other cultures allow it to be celebrated, even when they don't agree with it? I think we need to decide if the festival is only for aspects of other cultures that aren't confronting to the Canberra mainstream culture. Or alternatively, if it is for all aspects of other cultures that those cultures decide is important to represent. Stephen Esdaile I think reason why this case is garnering such attention is that abortion is very divisive issue, and a stall advocating pro-life is very closely linked to shaming women and bodily autonomy. Having said that, if a decision is made to not have this stall there, then all non-MCF related stalls should also be banned. I'm not for targeted bans, a theme should be set and adhered to. It just happens to be that the anti-abortion stall is the topic of discussion for this thread. Paul Chubb no, not saying that at all. Chips on a stick and generic pop songs don't politicise this event like pro life stalls do though. Isn't the aim of multi culti to bring people together, rather than dividing them? My point is that it goes against the object of the festival. Jessicah Mullins I completely agree, but I don't like that this thread was started on a premise that one stall was inappropriate when there were several stall that had nothing to do with multiculturalism (or culture, full stop). The organisers need to be clear about what the scope of the festival is and stay with it. If it includes other non-cultural topics, then the right to lifers have as much right to be there as anyone. Maybe Family Planning should have had a stall straight across the path! Personally, I'd pull all the peripheral stalls out next year and stick to the core message about cultural diversity. Stephen Esdaile Let's be clear: the message that the stall is trying to put out there is absolutely inappropriate, so is their behaviour. Unlike some of the other stalls (to my knowledge) this organisation contributes to the psychological harm of women. For the past 16 years it has stood outside of clinics harassing women as they attempt to get medical advice and make decisions about their health. So whilst I agree that a decision one way or the other needs to be made as to what kind of stalls can be at the MCF, and that it be applied equally.... it would remiss not to acknowledge the harm that ACT Right to Life and its ilk does to women. Stopping access to safe legal medical procedures for women and forcing them to undergo dangerous unregulated abortions is not a "culture" . So basically Jess Chalker saw a stall pushing views she doesn’t agree with and she wants it banned? Has the multicultural festival made Canberra a better place?